When Macron and Trump met the first time, he poked the tiger. I was surprised not to see Trump tweeting himself body-slamming the young punk. Later, the youngster invited President Trump to meet in Paris on Bastille Day. I certainly wanted to know why. When the French President invited the American one to Paris, it was, on the face of it, to commemorate a famous anniversary. But as CBS News senior foreign correspondent Mark Phillips reports, the visit is also another chapter in what’s developing into a contest of wills between two leaders who are so similar, but so different. The unusually personal show of force was no accident. Francois Heisbourg, a foreign affairs expert with a Parisian think tank, says Macron “not only thought about it, but prepared for” the encounter, and had a purpose going into it. That’s about as tough as Macron will get with Trump. Ever. France is in trouble and they pretend not to notice. The centrist president’s invitation to Trump might at first seem surprising, after he publicly asserted his superiority by crunching Trump’s knuckles at their first meeting in May and later rebuked him for pulling the US out of the Paris climate accord. But the invitation is part of a determined strategy by Macron, who – observing the US president’s increasing isolation on the western stage – has sensed an opportunity. Christophe Castaner, a government minister and spokesman, described it as a kind of persuasive bridge-building with Trump. “Sometimes Trump makes decisions we don’t like, such as on climate. But we can deal with it in two ways: we can say ‘We are not going to talk to you,’ or we can offer you our hand to bring you back into the circle,” he said. What a rude awakening awaits Macron. He will soon find out that Trump needs to play with no one. He has all the toys. 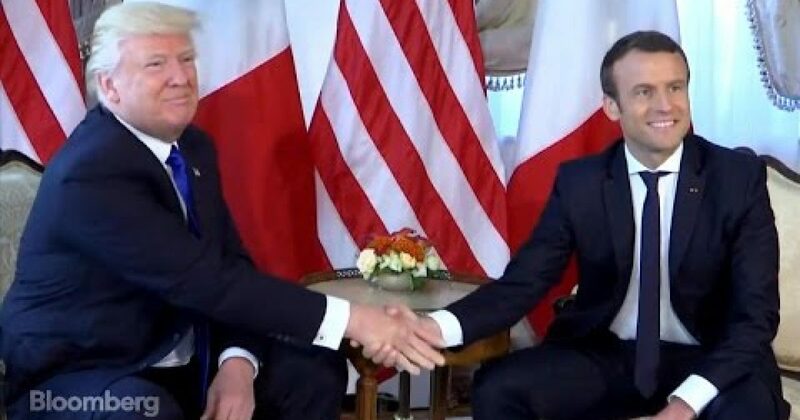 Even Macron’s childish display of the handshake showcases his lack of depth. The world media wants another darling, particularly after their black “pet” failed miserably. Macron will suffer the same fate. For leftists to want another Obama is a fool’s folly. But the Left are replete with fools. If leftists believe Macron will sway President Trump, they remain delusional. I’m anxious to see Trump out this young punk in his place.